Well two out of three ain't bad. I'll have a lot more about basketball's pathetic conclusion to their season and the women's NIT win later. For now, we celebrate yet another Hockey East Tournament title. 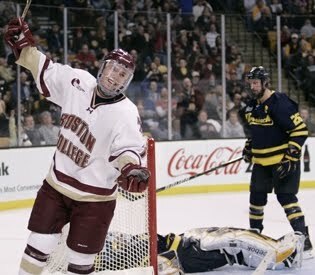 BC locked up their 10th title with a 5-3 win over Merrimack. The game was a back and forth affair for the first two periods. BC pulled away late. The conference named Cam Atkinson's the Hockey East Championship's Bill Flynn Most Valuable Player award for his two goals. BC has probably locked up a top seed in the NCAA Tournament. The official seed and where they will play will be announced Sunday morning on the Selection Show. Yale got the #1 overall seed.. BC got the #1 seed in the west and will play Colorado College in St. Louis in a week..
On the ESPN Frozen Four selection show, when they got to the West bracket, one of the commentators was blathering on about Nebraska-Omaha, the #3 seed in the West, and Barry Melrose cut him off and said, "Let me tell you what's going to happen: BC is going to win. It's a team of winners, and it would be hard to not pick them to win it all." Attaboy Barry! Go Eagles! Some strange bracketing in this thing, though. The East looks kind of weak with Yale, Air Force, Union, and Minn.-Duluth; while the Northeast looks really tough: UNH, Merrimack, Miami and Notre Dame. I love the way Barry Melrose, a total No BS, NHL PRO, always digs our hockey team--last year in the Frozen Four he was all over the speed and guts of the Eagles. It's so rare to hear someone behind the microphone who loves a good BC team in any sport, and Barry is so not a homer--he just knows how well coached, talented and tough the Eagles are on ice. Just love the guy! Go Barry! Go Eagles! Bring it on Ice! Let's see if I have this right. Boston College, the defending national champion, regular season winner of Hockey East (top to bottom the best college hockey conference in the country), winner of the Hockey East tournament, in latest USCHO/USA Hockey poll ranked #2 in the nation is "awarded" the #3 seed by the NCAA selection committee and sent 1038 miles from home to the Midwest regional in St. Louis? And, hey, it gets even better than that. To add insult to injury, our supposedly Midwest regional top seed is given the 8:00 p.m. (CST) game next Friday, so that if they should prevail, they would have approximately 4 fewer hours to recover against the winner of the lower seeded Michigan/Nebraska-Omaha game! Anybody find this just a little bit odd? Calls to Boston hospitals did not produce any reports of the Flipper or Joe Bertagna being in a coma. Maybe the selection committee wanted to see what would happen if you take the defending national champions right as they're peaking at just the right time (again) and then add a chip to their shoulder.